How sweet! 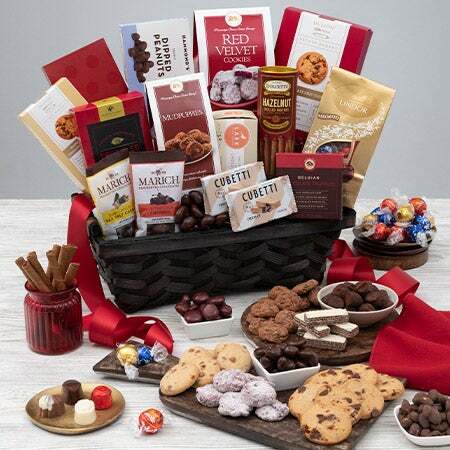 This gift basket offers enough delicious cookies for Santa and his hard working elves to enjoy! It also features a beautiful linen cloth to catch all of the cookie crumbs and a stunning holiday cookie plate! If this gift basket doesn t put you on the Nice list with Santa you must have been very very naughty. 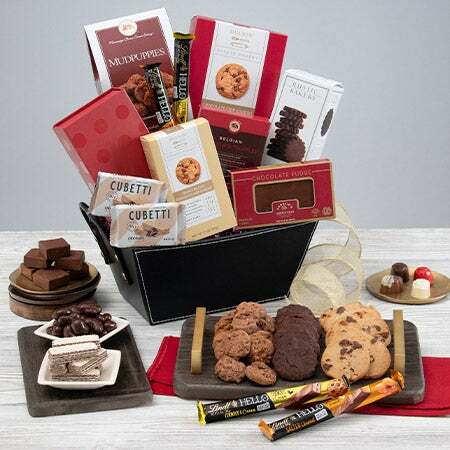 We have filled this very unique basket with a wonderful keepsake stoneware cookie plate which boasts a beautiful holiday design in three-dimensional detailing and reads "Happy Holidays". Its beautiful! Also included is a fantastic tea towel crafted with an appliqued holiday design and an abundant selection of our most delectable gourmet cookies. The selection of scrumptiously sweet cookies includes Triple Bliss Chocolate Chunk Cookies White Chocolate Macadamia Nut Cookies Dutch Chocolate Dessert Twists Chocolate Cookies dipped Holiday in creamy Milk Chocolate Butter Shortbread Cookies Chocolate Peppermint Cookies Hazelnut Biscotti dipped in Chocolate and Chocolate Peppermint Biscotti. This just may be the sweetest gift they ever receive!!! This beautiful Burgundy and Gold Drum basket will make a wonderful serving basket when lined with linen planter for their holiday poinsettias or simply a lovely decoration in their home or office this holiday season! We have used it to create a stunning gourmet gift arrangement which includes "Sounds of the Season" themed gourmet Snack Mix rich cream filled Chocolate Truffles decadent Belgian Chocolate Truffles creamy Kettle Fresh Chocolate Walnut Fudge an assortment of Luxury German Chocolate Cookies Buttercrunch Toffee with Chocolate and Cashews Dark Chocolate cream filled Butter Wafer Cookies Cinnamon Sugar Cookies gourmet Peanut Brittle Popcorn mixed with Cranberries and drizzled with creamy White Fudge Cranberry Bog Frogs (sweetened dried cranberries and roasted cashews in rich caramel and premium milk chocolate) Roasted Almonds with Sea Salt and festive musical picks which would look beautiful adorning their tree this Christmas! Accented with frosted pine and pine cones and topped with a beautiful designer bow this gift basket will have them humming a very happy tune this Christmas!! 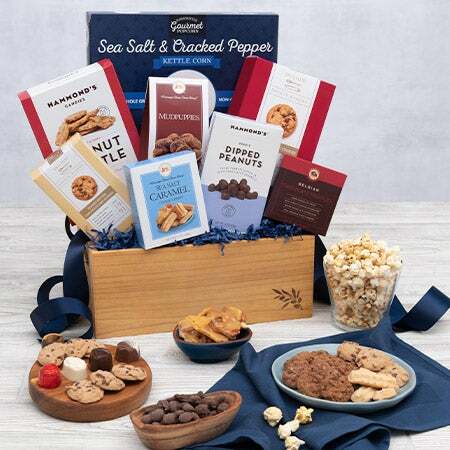 Featuring a large assortment of the finest chocolates delectable gourmet cookies rich handmade fudge savory nuts and more this gift basket is pretty much the perfect Christmas gift. Lets face it we all like to be spoiled during the holidays. We like to indulge ourselves with delicious goodies that are off-limits most of the year like decadent chocolates delicious cookies and the like. Well this large Christmas gift basket will help them to do just that. They will feel like a carefree kid again while indulging in creamy Chocolate Fudge Chocolate Dipped Truffle Cookies a large assortment of decadent Chocolate Truffles Dark German Chocolate Coconut Cookies gourmet Popcorn loaded with Pecans Caramel and Chocolate Dark Chocolate Mint Delights Dark and Milk Chocolate Grahams Smores Bark Turtle Supreme Cookies Chocolate Chip Cookies White Chocolate Amaretto cream filled Cookies Chocolate Covered Pretzels and delicious gourmet Sweet Chips! This stunning holiday gift offers a collection of large quantity items making it a perfect Christmas gift for an office or a large family! Theres nothing quite like a country cooked breakfast especially when its delivered right to your doorstep! Using the finest in gourmet from the kitchens of well loved companies like Stonewall Kitchens in Maine and Blackberry Patch in Georgia we have created this new and soon to be favorite Christmas basket. It is filled with delicious gourmet gifts for them to enjoy including Farmhouse Pancake and Waffle Mix (16oz) Caramel Apple Butter (12.5oz) Holiday Jam (12.5oz) (incredible!) Wild Blueberry Syrup (12oz) Garden Vegetable Cheese Wisconsin Onion and Cheddar Cheese Harvest Medley Fruit and Nut Mix French Vanilla Coffee Hazelnut Coffee Mint Sipping Chocolate White Chocolate Cocoa and a wonderful kitchen linen cloth! This gorgeous gift basket is one of our favorites! How sweet! 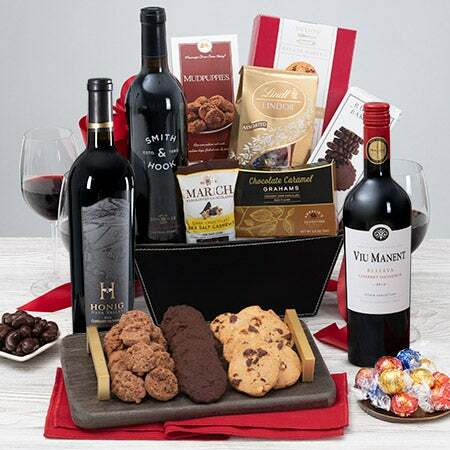 This gift basket offers enough delicious cookies for Santa and his hard working elves to enjoy! It also features a beautiful linen cloth to catch all of the cookie crumbs and a stunning holiday cookie plate! If this gift basket doesn’t put you on the "Nice" list with Santa you must have been very very naughty. Our deluxe "Christmas Cookies" gift basket includes a larger basket that overflows with great holiday favorites such as: a wonderful keepsake stoneware cookie plate which boasts a beautiful holiday design in three-dimensional detailing and reads "Happy Holidays". It's beautiful! Also included is a fantastic tea towel crafted with an appliqued holiday design and an abundant selection of our most delectable gourmet cookies. The selection of scrumptiously sweet cookies includes Triple Bliss Chocolate Chunk Cookies White Chocolate Macadamia Nut Cookies Chocolate Cookies dipped in creamy Milk Chocolate Butter Shortbread Cookies Lemon Snowball Cookies Hazelnut Biscotti dipped in Chocolate and Gingerbread Macadamia Biscotti handmade Key Lime White Chocolate Cookies Cranberry Cookie Straws Mudpuppies Chocolate Cookies Milk Chocolate Covered Grahams Toasted Almond Cookie Straws and Milk Chocolate S'mores. From the two large ceramic highly detailed keepsake ornaments - the incredibly delicious selection of goodies - the charm and beauty of the design and products - to the abundant size of this wonderful gift - this is sure to be a hit this holiday season! So be sure to reserve yours today!! *This beautiful set of 3.5 ornaments are hand painted ceramic Mud Pie originals with raised detail linen bow and twine hangers. This sugar free gift basket is a great alternative for those with diabetic needs or those just trying to cut down on sugar. This cheerful holiday basket offers bushel full of taste and style. Its fantastic! 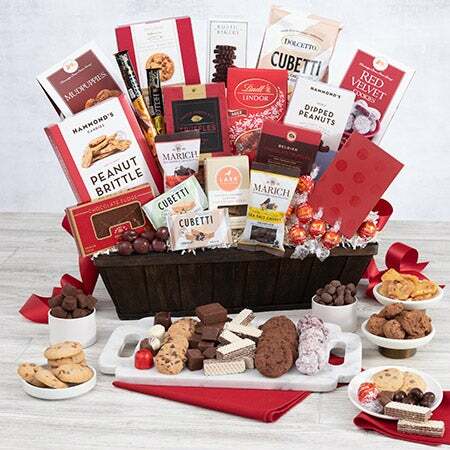 A wonderful red and white wooded slat basket arrives artfully arranged with creamy Cherry Cheesecake Fudge Marich Premium Double Dipped Chocolate covered Strawberries (yum!) Dark Raspberry Cream Filled Truffles Holiday Raspberry Tea Cookies in a pretty wreath box Cherry Avalanche gourmet Caramel Popcorn loaded with tangy Cherries and smothered in creamy White Chocolate Popcorn mixed with Tart Cranberries and dipped in White Fudge gourmet Cranberry Cookie Straws Chocolate Cherries and Berries Fruit Mix Chocolate Chip Raspberry Cookies Chocolate covered Bing Cherries and Premium Dark Chocolate with Raspberries! What a wonderful gift to make sure that their Christmas is berry merry! Holidays and celebrations are the best things which give you memories to cherish. Gift Basket Village makes your celebration even more special by offering an extensive range of Holiday Gift Baskets. We specialize in offering creative and professionally designed gift baskets with the highest quality gourmet goodies. We assure that our unique gifts will delight your special or loved ones. This new Village favorite is sure to be a hit. It features a handsome wooden trunk filled with a delicious selection of sauces mixes a chili kit cheeses and more! We just know they are going to love our "Down Home Christmas" gift basket. It starts with a handsome wooden trunk filled with a "Classic Chili" Pasta and Seasoning Kit Chipotle Burger Mix Pepper Cheese Hickory Smoked Cheese crunchy Asiago Cheese Straws Bruschetta Parmesan Crisps and Honey Mustard Pretzel Nuggets! What's not to love? *Free Ground Shipping or Save Off Expedited Shipping Savings will be reflected on the shipping calendar during checkout process If you're looking to send something sweet this holiday season, you're in luck! Inside this gorgeous basket, we've arranged a variety of our favorite chocolate treats, each artfully crafted using only the finest gourmet ingredients. Boasting slow-melting chocolates, irresistibly crisp cookies, and milk chocolate sea salt caramels, this gorgeous basket is one Christmas gift they'll find irresistible! *Free Ground Shipping or Save Off Expedited Shipping Savings will be reflected on the shipping calendar during checkout process An average breakfast on a day this big? As if! On Christmas morning, only a gourmet breakfast will do, which is why we created this superb gift! 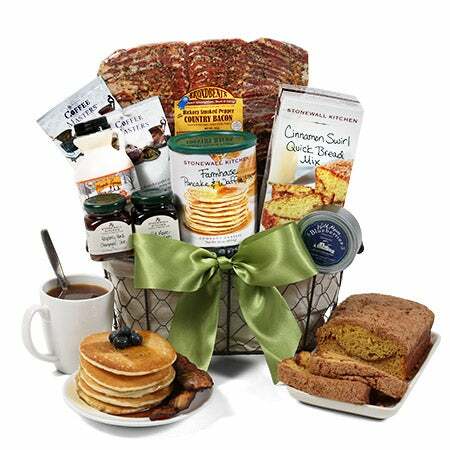 It's full of delicious foods, like luxurious pancake mix, premium ground coffee, and fresh Maine blueberries, which are united in a beautiful basket to create a gift that makes an already great morning even better. *Free Ground Shipping or Save Off Expedited Shipping Savings will be reflected on the shipping calendar during checkout process A morning as exciting as Christmas deserves an extraordinary breakfast! That's why we've collected some of our favorite gourmet foods and artfully arranged them inside this beautiful willow basket. 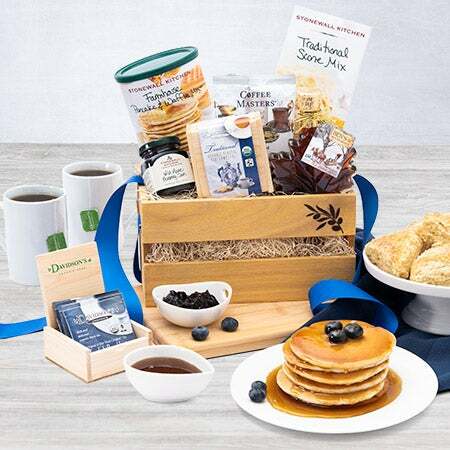 Boasting irresistible breakfast staples, like Maine's freshest wild blueberries, Grade A maple syrup, and slices of hickory smoked bacon, this lovely gift makes an already wonderful morning even more special! *Free Ground Shipping or Save Off Expedited Shipping Savings will be reflected on the shipping calendar during checkout process Make their Christmas wish come true with this gift of exquisite chocolate treats! Inside one of our signature woven baskets, our experts have artfully arranged a collection of exotic delights, like smooth chocolate wafer cookies and tempting crispy cookies, allowing you to make their holiday this year sweeter than ever! Supply them with everything they need to eat, drink, and be merry this season! 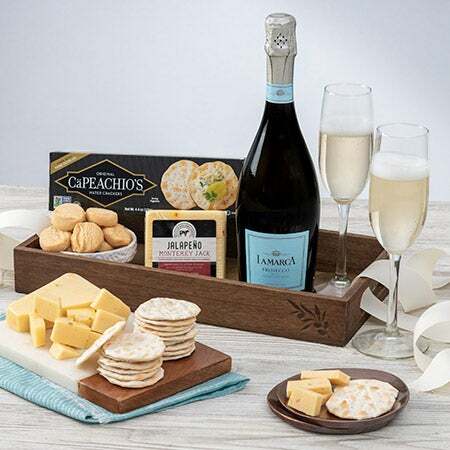 Inside this elegant basket, our experts have brought together an assortment of delectable gourmet foods that are perfectly paired with your choice of three exceptional wines. Boasting chocolate-filled wafers, dark chocolate squares and Belgian chocolate truffles, this impressive gift is sure to make the season enjoyable! *Free Ground Shipping or Save Off Expedited Shipping Savings will be reflected on the shipping calendar during checkout process We think that Christmas gifts should be the absolute best of the best. (No one wants to send something subpar for the holidays!) And that's why we created this stunning arrangement, which includes some of the most exclusive gourmet sweets! Inside a beautiful basket, we've brought together delicious treats, like golden pretzel twists, roasted peanuts, and rich chocolate truffles, creating a generous Christmas gift they'll find irresistible. *Free Ground Shipping or Save Off Expedited Shipping Savings will be reflected on the shipping calendar during checkout process Christmas is a time when dreams come true, which is why this basket is one of our most popular holiday gifts. It possesses the craved, decadent tastes of dreamy, artisan chocolates that are skillfully crafted using only the highest quality ingredients. Perfect for spreading holiday magic to family, friends, and clients, this basket is a Christmas wish fulfilled.